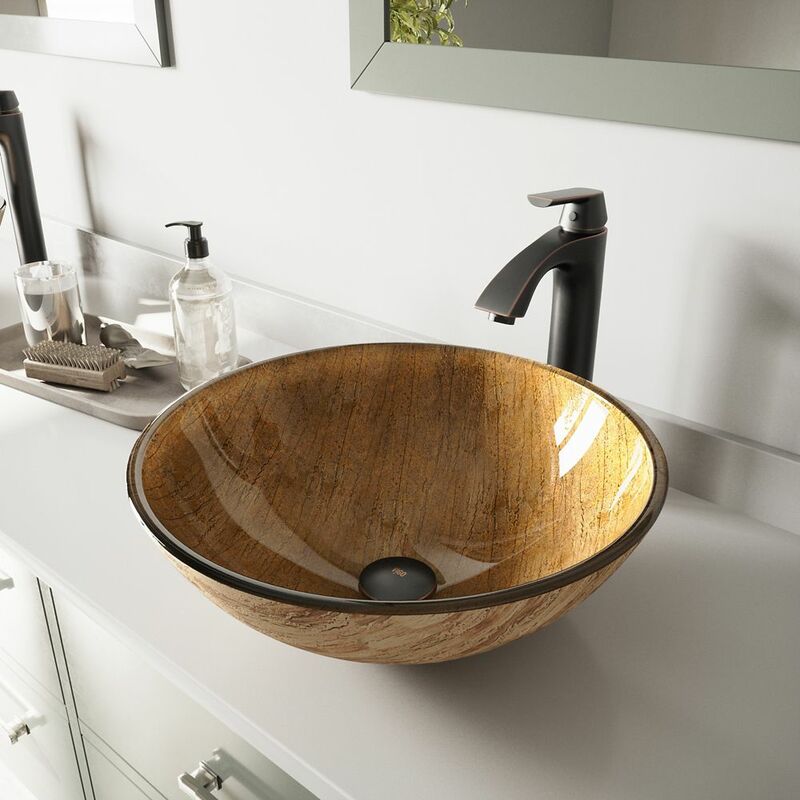 Glass Vessel Sink in Amber Sunset with Linus Faucet in Antique Rubbed Bronze is rated 4.9 out of 5 by 63. Rated 5 out of 5 by DebE from Great customer service I had a problem and they are sending me the part the same day. That is amazing. Rated 2 out of 5 by DebE from Beautiful set... Everyone loves the set and how it looks. However, the sink stopper is chipping. Less than a year of regular use. Very Disappointing. Rated 5 out of 5 by EchoTheLegend from Gorgeous sink I bought this as part of a bathroon remodel. Looks great. Only suggestion would be to not have ugly hot/cold on faucet. Rated 5 out of 5 by heck1 from WOW, more beautiful then I imagined. Packed beautifully...and cannot wait... WOW, more beautiful then I imagined. Packed beautifully...and cannot wait to have it installed! Rated 5 out of 5 by Buffy from Stunning These are stunning pieces that add a wow factor to my master bathroom. Rated 5 out of 5 by Nona from This sink and faucet are beautiful. The style is perfect... This sink and faucet are beautiful. The style is perfect for our cabin/house in the mountains. Easy to install. Rated 5 out of 5 by Stuffy from It is beautiful, and took little time to install.... It is beautiful, and took little time to install.